Need advice about a specific Acura RDX problem? Chart based on 66 repairs. 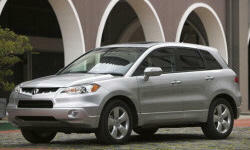 See TSBs and recalls for the 2007 Acura RDX. Chart based on 58 repair trips. The repair cost chart excludes repairs made under warranty, do-it-yourself repairs, and repair trips that include maintenance. See repairs for all Acura RDX model years. 24800 mi THE CAR WOULD SUDDENLY APPLY THE RIGHT FRONT BRAKE, CAUSING THE CAR TO VEER ONTO THE SHOULDER OF THE ROAD UNEXPECTEDLY. THE "SHAWD" WARNING LIGHT HAD BEEN COMING ON OCCASIONALLY BEFORE THE FAILURE. WE ARE NOT CLEAR AS TO WHAT WAS REPLACED. C $280 Told a tire pressure monitor was faulty, and that not "Acura" sensors, but they were on the car when it was newly purchased.I checked the tire pressure, and they were questionably low. Inflated all tires another2 psi, problem gone. C $1000 Transmission oil mixing with coolant. Problem with Radiator leak. US $135 Brake caliper and hose replaced. 89000 mi Navigation system failed and had to be replaced. The dealer that I purchased the Acura had promise to update my map and couldn't load it so they had it done at an Acura dealer. It cost the dealer over $1400 for the update and the new Nav. US $1300 AC has to be replaced. 122000 mi Heater for passenger seat no longer working. Due to parts cost and require to order them we decided not to fix the issue and live with it as is. LED for the dash clock and some control buttons have stopped working. We decided not to repair and live with vehicle as is. US $820 AC compressor was replaced. US $350 Alternator was replaced. C $900 All 4 brake disks, pads replaced Bushings replaced. 9000 mi Warranty Fuel pump repair. US $350 Acura A156 service: oil change, rear differential fluid and engine coolant change. C $508 Vehicle required a new starter. Symptoms leading to a new starter was that the vehicle started to hesitate during initial start up. 51460 mi Rust at base of drivers door. Repaired under original owner body rust Sovereign" lifetime insurance policy bought at purchase. Sub car provided. No charge; no hassle. No rust anywhere else on car. Great dealer. C $900 Very slow leakage of fluid from timer chain compartment--four hours. 9000 mi Loud squeal when starting cold engine. Dealer could not replicate. 38000 mi Replaced winshield wiper motor. US $1000 Power steering line was leaking, needed to be replaced. 67000 mi Air conditioner condenser is leaking and needs replaced, condenser ordered from dealer and will be installed in 2 weeks. Condenser under warranty and no charge for repairs. 67500 mi Replaced air conditioner condensor Air conditioner condenser is leaking and needs replaced, condenser ordered from dealer and will be installed in 2 weeks. Condenser under warranty and no charge for repairs. July air conditioner condenser was replaced by dealer at no charge. US $1450 transmission line ruptured inside radiator, requiring replacement of radiator and transmission line. Flushed engine and transmission. 88000 mi Turbo charger needed replaced. US $200 Clicking noise when turning right. Dirty oil in the rear differential. Replaced oil, solved. 16000 mi Spring-loaded cup holder door on console broke, new door ordered and replaced New cupholder installed. 31000 mi A right rear shock was found to be leaking. The unit was replaced at no cost to me. 56000 mi The NAV disc player malfunctioned and "ate" the actual disc rendering the NAV function useless. The unit was removed by the dealer and sent out for repair. New disc ordered. All covered under extended Acura warranty. 52080 mi Fog and moisture in the headlights. Acura dealer replaced under warranty. $1000 cost. 60760 mi Turbo gauge sensor gone bad. Reports inaccurate boost. 45260 mi Motor for windshield washer to be replaced under ext. warranty. Interval between wipes is not regular and blades do not stop at home position any longer. Issue with interior lights staying on as well (service bulletin). Traded in car. C $1500 Coolant leak at the back of engine near turbocharger. Exhaust manifold gasket needed replacement. 96100 mi Replaced starter under warranty for faulty aftermarket starter that was replaced two years ago but had a four year warranty. C $1600 Exhaust manifold gasket needed to be replaced and well as a tube going through turbo as there is a liquid cooled manifold and turbo. 3000 mi backfired twice while on the throttle.Dealer could not find problem. 6000 mi The RDX backfires at low rpm as your giving it less then full throttle.This happens only after it has been sitting for a while.I can`t make it happen at will and neither can the dealer. There is a loud noise and I lose power for a few seconds. 7000 mi Backfiring problem again; dealer can't replicate. 9000 mi Backfiring problem again; dealer can't replicate. 12000 mi Sunroof rattle, repair failed. Second trip for rattle, again unsuccessful. Rattle later went away on its own. See our lemon odds and nada odds page to see vehicles with no repairs or vehicles with more than three repairs. To see how frequently 2007 Acura RDX problems occur, check out our car reliability stats.